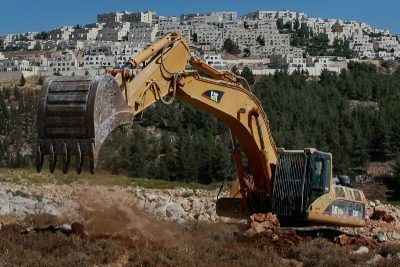 The Likud party leadership met Sunday and voted unanimously in favor of a resolution that effectively annexes the Israeli colonial settlements constructed on illegally-seized Palestinian land in violation of international law. During the discussion before the vote, Public Security Minister Gilad Erdan told the Likud Central Committee, “The time has come to express our Biblical right to the land”. Erdan then referenced the U.S. President’s December 6th declaration of Jerusalem as the capital of Israel, saying that the Israeli government should take advantage of this opportunity to seize permanent control of the land. This marks a unilateral action by the state of Israel, backed by the United States, to take over territory through the use of military force and expand Israel’s (never declared) borders while pushing out, killing and denying the presence of the indigenous Palestinian population. As Juan Cole pointed out in 2010 in his synopsis of the history of the city of Jerusalem, “The Assyrians conquered Jerusalem in 722. The Babylonians took it in 597 and ruled it until they were themselves conquered in 539 BCE by the Achaemenids of ancient Iran, who ruled Jerusalem until Alexander the Great took the Levant in the 330s BCE. Alexander’s descendants, the Ptolemies ruled Jerusalem until 198 when Alexander’s other descendants, the Seleucids, took the city. With the Maccabean Revolt in 168 BCE, the Jewish Hasmonean kingdom did rule Jerusalem until 37 BCE, though Antigonus II Mattathias, the last Hasmonean, only took over Jerusalem with the help of the Parthian dynasty in 40 BCE. Herod ruled 37 BCE until the Romans conquered what they called Palestine in 6 CE (CE= ‘Common Era’ or what Christians call AD). The Romans and then the Eastern Roman Empire of Byzantium ruled Jerusalem from 6 CE until 614 CE when the Iranian Sasanian Empire Conquered it, ruling until 629 CE when the Byzantines took it back. The ruling Israeli Likud party is to convene, on Sunday, to vote on urging party leaders to formally annex the occupied West Bank to Israel, and allow unlimited construction in illegal Jewish settlements. A number of party heavyweights have released statements or videos expressing support for the vote, which will take place at the Avenue Conference Centre, near Ben Gurion Airport, Israeli newspaper Times of Israel said. They include Knesset Speaker Yuli Edelstein, Jerusalem Mayor Nir Barkat, Public Security Minister Gilad Erdan, Environmental Protection Minister Ze’ev Elkin and Transportation Minister Yisrael Katz. The keynote address, at the confab, was reportedly given to longtime Netanyahu opponent and former cabinet minister Gideon Sa’ar, also a backer of the resolution. Likud activists in the illegal settlements of the occupied West Bank, who gathered over 900 signatures of Central Committee members, called for allowing the resolution to be presented without requiring the consent of party leaders. Extending Israeli law and sovereignty means considering the occupied Palestinian lands as part of Israel, which was built on 78 per cent of Palestine’s area occupied in 1948.